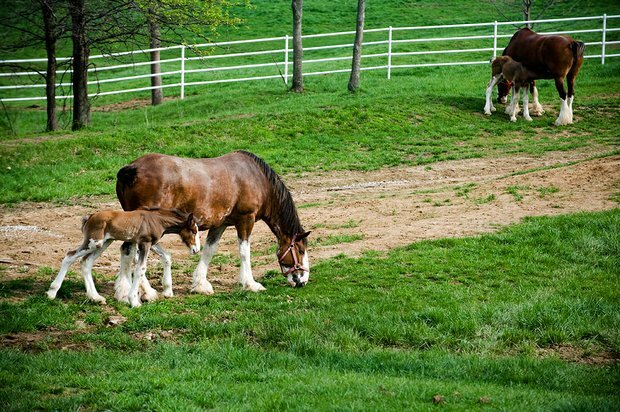 It was a bumper crop for the Budweiser baby barn, this year. 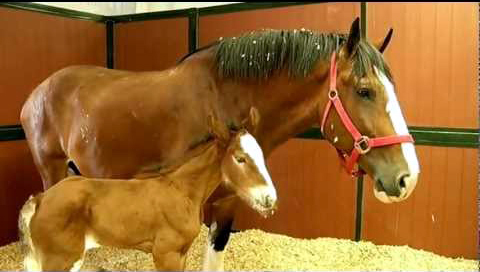 The world famous Budweiser Clydesdales delivered 18 fillies and 10 colts in the breeding season that ended last May at the Warm Spring Ranch in Boonville, Missouri. 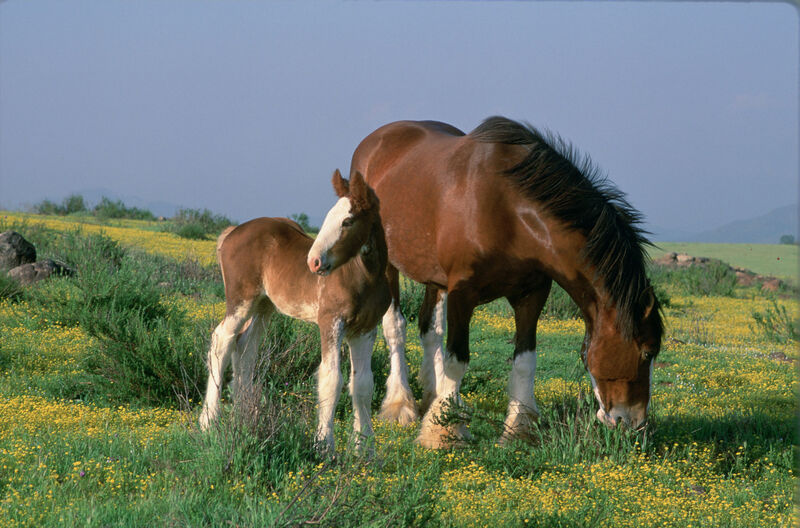 Between 30 and 40 Clydesdale foals are born at Warm Springs Ranch each season. 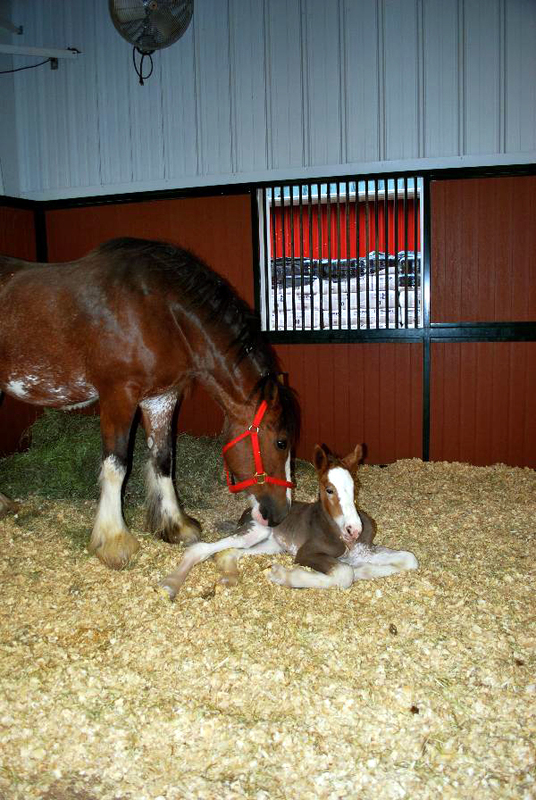 Dedicated staff is on-site around the clock to ensure the baby Clydesdales are welcomed into the world in comfort and safety. Warm Springs Ranch has a 25,000-square-foot breeding barn with a veterinary lab and 10 pastures, each with a customized, walk-in shelter and free-flowing water dispensers. 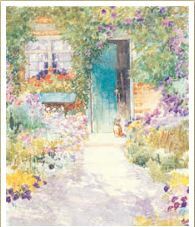 The farm sits on 300-plus acres of land. 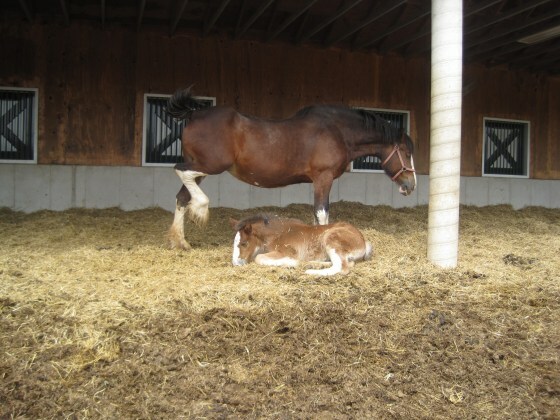 The Clydesdales born with the proper markings for a Budweiser Clydesdale – a bay coat, a blaze of white on the face, four white stocking feet, and a black mane and tail – have a future spot on one of the traveling hitches. 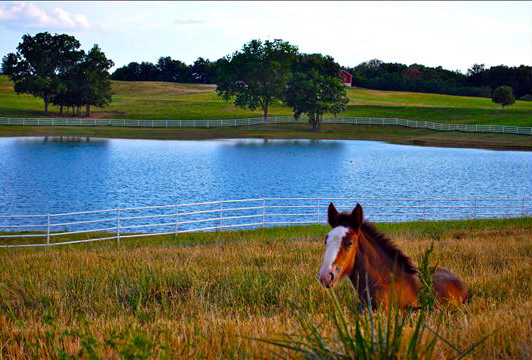 The ranch is open to visitors by reservation daily except Wednesday for tours that last about 90 minutes. 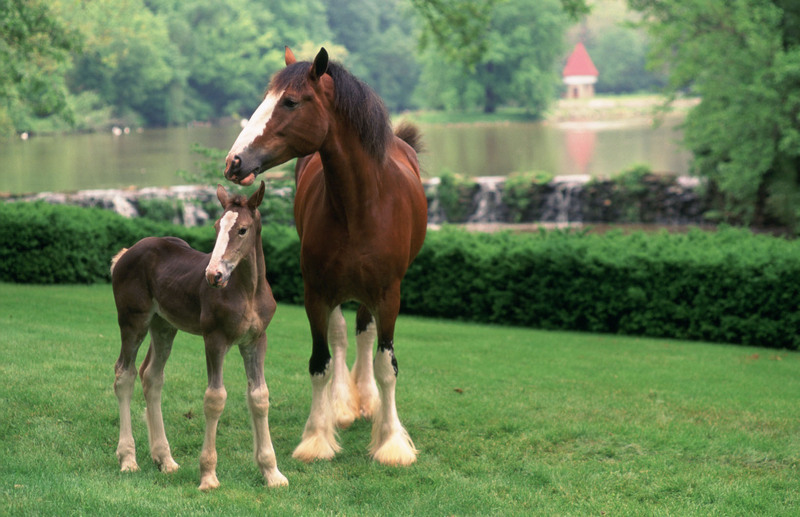 Last year more than 11,000 people visited the ranch to see the Clydesdales, which have been a symbol of Budweiser since 1933. Oh, they are so adorable! I love how Cooper just walked underneath Mom. I’d love to visit there one day. 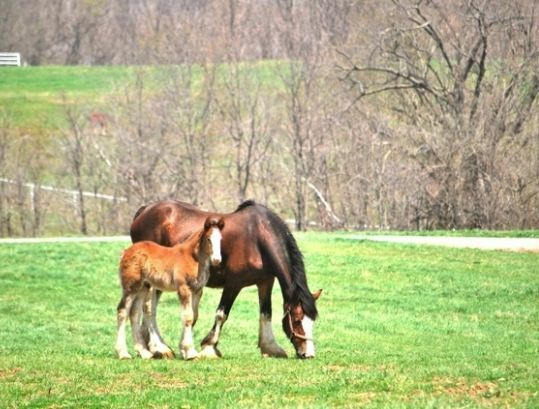 We did see a few of the Budweiser Clydesdale herd at Busch Gardens in Virginia years back. They are huge and loveable. Great videos. Those babes are just too adorable. However, I am having serious withdrawal. 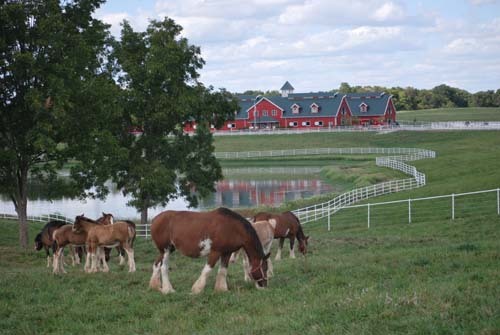 Before moving the Budweiser breeding farm to Missouri, they were at Menifee, California … a tolerable distance from us. I’m happy to see the program is still progressing, considering the sale of Budweiser. They really are a part of even the none horse people of America. Oh, you are clever … “surgeon general warning”. Oh my goodness!! Those babies are so cute!!! I love how in the video Cooper walked under his mom. 😀 Adorable! I’ll have to add that to places I want to visit someday. Thanks for sharing! I agree. Definitely goes on the list. However, I’m inclined to want to take home samples. Guess that would mean bigger barn, pasture, hay barn just for starters. Oh well. What happens to those who don’t fit the description needed to join up with the team? Where do they go? I was wondering the same thing. Did some searching, but haven’t found the answer. Also, what happens to the retired Budweiser Clydesdales? I hope someone reading this can give us some information. first thing I thought of too…what happens to the others and the retired ones??? It is so good to see the breed thriving and Budwesier doing a grand job! Such a shame that in their native Scotland they are now on the Rare Breed Register! I have 2 of these fabulous horses and use them for riding. Oh and they did steal a drink from abottle of Budweiser I had at the stables. Budweiser UK thought it was hilarious when I wrote and told them. Good job Budwesier! Fabulous horses. You are so right, they are fabulous horses! How fortunate you are to have two. How amusing their snitching a bottle of Budweiser. Seems the company could use that for a commercial. Thanks for your comment. The “babies” are so cute and grow up to be such beautiful, gentle animals. A joy to see!!!! May they always be with us as the world needs more gentle beauty! Ok ill take two .. when can i expect delivery !! please …. They truly are majestic! What a magnificent breed! Keep it up Budwieser! Coodos to the guys on the ranch . What a great job that would be!! What does happen to the Clydesdales that do not match the description? My daughter and I visited them yesterday here in Brookhaven, MS. We both love horses and could just sit and watch them for hours. We definitely want to come visit the farm one day, but I am afraid I would lose my daughter there. She would never want to leave. Keep up the great job you all do with these beautiful horses and we appreciate you sharing them with us. I used to work with 4 from the KY Horse Park. I have much respect to be able to run 10 or more, as we only had 4. They are gentle giants until hooked up to wagon. 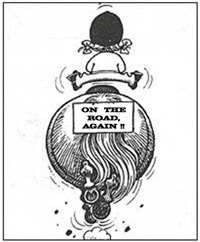 All, they want to do, is go, and we was running them, in parades. They, hate to stop for a few minutes, then go 100 feet. Hats off the the crews who run these awesome horse.